Maybe it's just me, but it seems like the story of Halloween's origins is EVERYWHERE this year, which means that just about every local paper in America is letting readers know about the day's connection to Irish culture, folklore and immigration. It's all good stuff. I just thought I'd provide a little note to all the stories about Ireland and Halloween, particularly as it relates to the Jack-o'-lantern. Most of the newspaper articles explain, rightly, that in Ireland a Jack-o'-lantern were carved out of turnips. However, this may or may not mean what you think. What am I getting at? Well, I'm saying that what one person calls a turnip may not be what you call a turnip. I only became aware of this a couple of years ago when I was home in upstate NY with my family. My mother took my son to the supermarket to get the groceries. At one point my mother told him to go over and get a turnip, which he duly did. However, when he returned with the root vegetable my mother wanted, some busy body lady butted in to inform my mother that wasn't a turnip, but a rutabaga. When they got home my son related the exciting tale of the woman who tried to tell him that a turnip was called a rutabaga. (Oh and was that name ever fun for the 6-year-old boy.) 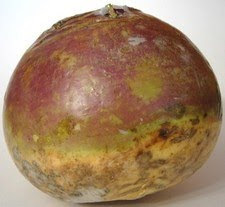 My mother than calmly stated knew it was a rutabaga, but she also knew what she wanted and what she wanted was known as a turnip in Ireland and knew that's what my son would get her. That's all well and good, except I was raised in America and never once did I hear that vegetable called a rutabaga. My mother, born and raised in Ireland, never used the word, but neither did my grandmother, born and raised in America. What was going on here, some kind of conspiracy to keep me in ignorance? I had passed my 40th birthday completely unaware that what I called a turnip many called a rutabaga. My wife didn't know about the rutabaga either, but she deftly dropped into the conversation that in England they call them swedes. So, now I know that there are three different names for a vegetable that I only ever knew as a turnip. And, apparently, I've never had the 'other turnip', which is not yellowy orange. I bet it's not as tasty. Anyway, this is all beside the point. What you need to know is that if you want to make a traditional Irish Jack-o'-lantern today you need to get a turnip/rutabaga/swede, the one with the purplish top and yellowish bottom. No other turnip will do.